ITI Promotion O.N.221 Dated 01.02.2019. 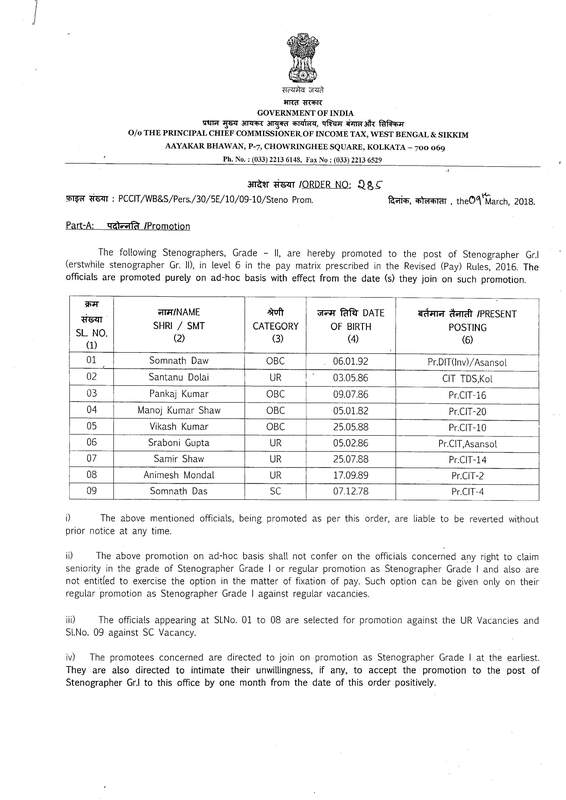 Sr T.A.Promotion Order no.220 Dated 01.02.2019. Sr TA Promotion Order No.190 Dated 01.01.2019. ITI Regularization Order No.185 Dated 20.12.2018. TA Promotion O.N.184 Dated 20.12.2018. AO GR-III Promotion Order No.135 Date 01.11.2018. Regarding Promotion of Hindi Steno. MTS Confirmation O.N.72 Dated 12.07.2018. O.S. Promotion O.N..238 Dated 13.12.2017. ITI Promotion order no.235 Date 08.12.2017. OS Promotion O.N.234 Dated 08.12.2017. Notice Server Promotion O.N.233 Date 08.12.2017. Result for Data Entry Skill Test,2017. ITI Promotion order no.201 Dated 06.11.2017. MACP latest Instruction Dated 23.10.2017. NS Promotion O.N.196 Dated 26.10.2017. ITI Promotion order no.192 Dated 25.10.2017. Regularization of O.S. O.N.185 Dated 12.10.2017. Sr.T.A. Promotion and Seniority O.N.174 Dt.04.10.2017. O.S. Promotion O.N.167 Dated 18.09.2017. Sr T.A.Promotion Order No.139 Dated 23.08.2017. Notice Server Promotion O.N.108 Date 26.07.2017. OS Promotion O.N.107 Dated 25.07.2017. Sr TA Regularisation,Promotion & Seniority Order No.20 Dated 04.05.2017. Treatment of promotion to the Grade of OS / Steno Gr.1 for the purpose of Determining MACP entitlements. Circulation of Final Seniority List of the cadre of UDCs in the regions of West Bengal and Sikkim. 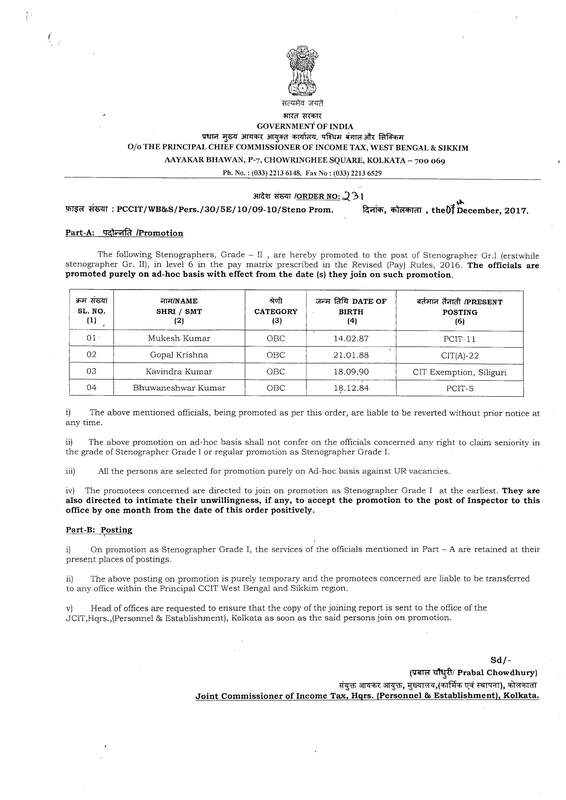 OS Promotion Order No.220 dated 31.12.2014.